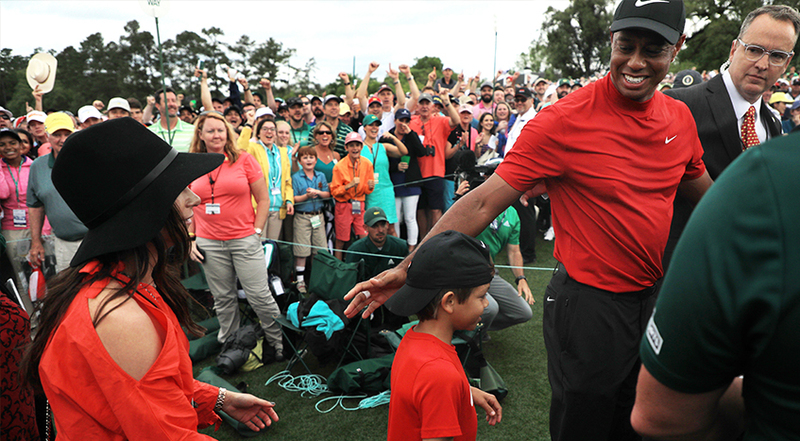 AUGUSTA, Ga. – Tiger Woods was just a kid himself, 21 years old when he won his first Masters (and his first of 15 majors) in 1997. When he won it for the fifth time on Sunday, he was a balding, 43- year-old father of two whose kids, 11-year-old daughter Sam Alexis and 10-year-old son Charlie Axel, were there to greet him after he tapped in for a meaningless bogey on 18 to win by one. "My dad (Earl Woods) is no longer here," Woods said, "but my mom (Kultida) is here, 22 years later, and I happen to win the tournament. And then to have both Sam and Charlie here-they were there at the British Open last year when I had the lead on that back nine, and I made a few mistakes, costing myself a chance to win The Open title. " 9659002] This time it was The Open champion Francesco Molinari who cracked, making double-bogeys at the 12th and 15th holes as Woods held steady. He followed his two-putt birdie at 15 with a near ace and a tap-in birdie at 16 , reaching 14 under par and giving himself breathing room for the bogey on 18. His kids had already come to grips with the fact that he was more than a YouTube golfer; they'd seen him win the 2013 World Golf Championships- Bridgestone Invitational, and he won the season-ending TOUR Championship at East Lake last fall, his long-awaited 80th PGA TOUR win. But the 83rd Masters Tournament marked his first major title since the 2008 U.S. Open, a span of almost 11 years. And he's done it all with a fused back after once fearing a future in which he would not be well enough to play with Sam and Charlie. What did they say to him when it was over? He still does not know. It was too loud with all the screaming, his own screaming included. "I think the kids are starting to understand how much this game means to me, and some of the things I've done in the game," Woods said. "Prior to comeback, they only knew that golf caused me a lot of pain. If I tried to swing a club I would be on the ground and I struggled for years, and that's basically all they remember. " Having seen their father at his lowest point, they've now seen him at his highest. "It means the world to me," Woods said. "Their love and their support, I just can not say enough how much that meant to me throughout my struggles when I really just had a hard time moving around. Just their infectiousness of happiness; you know, I was going through a tough time physically. There was a lot of times when I really could not move, and so that in itself was difficult. " " But just to have them there, and then now to have them see their Pops win, just like my Pops saw me win here, it's pretty special. … I'm excited about show-and-tell at school. "